It's a beautiful spring morning in South Dakota, but over our heads hangs the threat of a winter storm that could dump more than a foot of snow on our area in the next couple of days. Meanwhile, the water table beneath our house has risen so high that it's no longer fully beneath our house, but leaking in. While the sump pump purges much of the water, there's a lingering pool that needs its own special attention. And there's the pile of wood that still needs to be split and stacked. And someone needs to fire up the lawn mowers to make sure that once the expected snow or rain arrives, we've got a way to mow the grass. 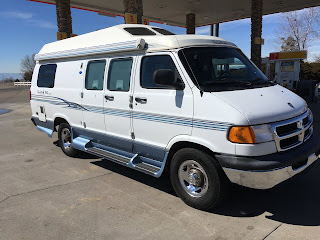 At the same time, our new travel van, our little RV, what they call a class B, is waiting in the driveway for us to escape. We need less water, less work, and less bad news. I'm ready to hit the road. Our new travel van awaits us. Meanwhile, every day there comes a new sign that the head of our government is an addled, angry head whose strategy is to do more than enough to keep his name at the top of the news feed, sometimes by figuratively lopping off the heads of the people around him.